Urban Outfitters offers these classy, fake tampon “Booze Tubes” for females to smuggle into concerts and sporting events. The thought is that no one is going to extensively search your tampons. Beyond the specified contraband uses, it’s great for stashing extra cash in a lady’s purse, drawer or car. A clandestine grow operation was built in an elaborate underground bunker in Tennessee a few years back. The escape tunnel entrance was concealed under a false stone that lifted up to allow access. This computer keyboard is discontinued, but it opens up reveal a secret stash compartment. These non-firing 20mm Naval Practice Rounds available through military surplus have a screw-off end that can be removed to reveal a small secret compartment within. They say the compartment is there so each could be weighed down to match the weight of a live round. 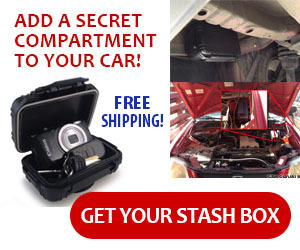 This fake car cigarette lighter listed on Amazon contains a secret compartment for pills or other small valuables. Custom Design Cabinets, out of Las Vegas, Nevada, can make secret doors and custom cabinetry. Here they’ve hidden a full-size safe behind a hidden door made to look like a series of drawer fronts. This diversion safe was displayed on SurvivalistBoards in a thread about hiding valuables. It’s a very well executed hidden gun safe that’s disguised to look like a set of reel-to-reel recorders. If anyone has additional info on this conversion, let me know! These Pringles Chips cans include a secret stash compartment in the bottom. The top remains sealed, and even contains actual chips to make it seem like an ordinary Pringles can. This set of hollow book safes from Atlanta Cutlery includes two books, Higher Power and Peace Within, each capable of concealing a handgun.